Cirrhosis of the liver can be characterized by liver scarring and gradual deterioration of the liver function which can stop this organ from functioning properly. This kind of irreversible liver damage can be helped by a variety of natural therapies that can prevent further liver damage and help restore some of the damaged functioning ability. Milk Thistle or Silymarin as it is commonly known, can prevent the toxic effects of certain drugs from acting on the liver, functions as an effective liver tonic and and prevent further damage. 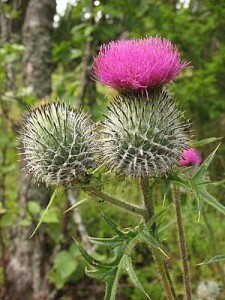 Milk thistle is also known as artichoke, holy thistle and Mary thistle. The scientific name for this plant is Silybum Marianum. This plant has been used by ancient physicians and herbalists to treat many liver and gall bladder diseases over 100’s years. Milk Thistle is widely used today and is very effective for liver conditions such as cirrhosis of the liver, alcoholic and viral hepatitis and liver poisoning. It can also be used to protect the liver against the effects of many medications that are toxic to the liver. The standardized form of milk thistle extract is known as Silymarin which is a mixture of at least seven chemicals. The most active chemical in this mixture is known as silibinin. This substance is a composition of two substances, silibinin A and B and interestingly it is used intravenously as an antidote for poisoning from the death cap mushroom called Amanita Phalloides. Studies on animals have shown that milk thistle extract can help alleviate liver damage from acetaminophen and alcohol. Acetaminophen is a fever reducer and pain reliever and when taken for a long period or a overdose is highly toxic to the liver and can cause death. How does Milk thistle help with cirrhosis of the liver? Silibilin present in milk thistle for liver health is thought to function by displacing the damaging toxins that bind to liver cells, leading to scarring and cirrhosis. Furthermore this substance has properties which may help regenerate the damaged liver cells. Milk Thistle can act as an antioxidant and protect the liver cells from oxidative stress caused by various toxins. It may be used to stabilize and strengthen liver cell membranes which are vital in protecting the liver cells from damage. In fact in Europe, milk thistle is given to patients who are put on prescription drugs which have the potential to damage liver cells. A double- blind study was conducted with 170 participants. This study was a placebo controlled study and covered alcoholic cirrhosis and non alcoholic cirrhosis. The group taking milk thistle showed a 4-year survival rate of 58% while those in the placebo group showed a 4 year survival rate of 38%. This difference further highlights the benefits of using milk thistle to prevent liver cirrhosis and damage. How much Milk Thistle is considered beneficial? An extract of milk thistle preparation is standardized to contain 70% silymarin. It is supposed to be taken as a standard dose of 200 mg two to three times daily. Although it has many beneficial effects, its a good idea to work with a physician to formulate optimum doses and avoid side effects if combined with other medications, particularly if the cirrhosis is in an advanced stage. A more effective form of milk thistle is when silymarin is combined with phosphatidylcholine in a preparation. The standard dosing for this preparation is 100 to 200 mg twice daily. Milk thistle is a very safe and effective herbal remedy to counteract the harmful effects of liver disease. It is believed to have very little toxicity. In most of the animal studies, no side effects have been observed even when this substance was administered over a prolonged duration of time. Some mild gastrointestinal side effects are reported by a few individuals who took this preparation. Very rarely, some even complained of severe abdominal discomfort. Because milk thistle has been extensively used as food, it can safely be used by women who are breast feeding or pregnant. However the level of safely in young children, nursing mother, pregnant women and those individuals with severe kidney disease has not been clearly established . Although no important drug interactions have been observed with this drug, silymarin can contain a chemical called beta-glucoronidase. This is an enzyme which interacts with oral contraceptive medication and reduces their effectiveness. Therefore those individuals who are suffering from cirrhosis of the liver and are trying to practice family planning, should practice other methods of contraception instead of oral drugs if they are using milk thistle, silymarin extract.